With the abnormal rise in fuel prices across the country, the Congress state unit of Meghalaya staged a protest demonstration in Shillong. The protest was part of the nation-wide call by the All India Congress Committee to stage protest against fuel price hike across the country. 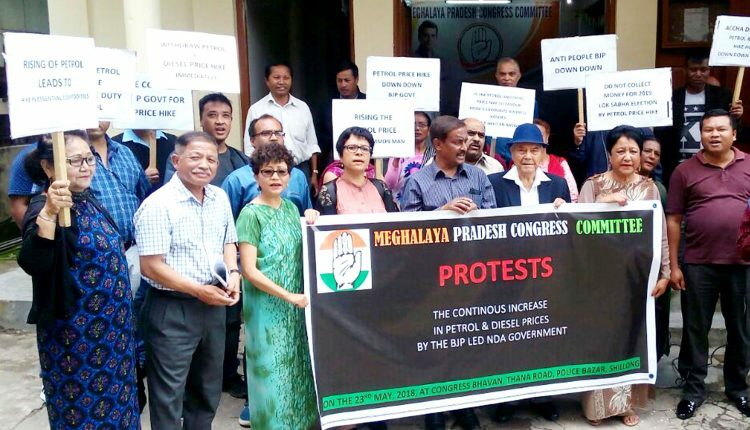 The Meghalaya Pradesh Congress Committee registered their protest through a demonstration at the Congress Bhawan in Shillong on Wednesday. The petrol and diesel prices have witnessed every day rise causing much anguish among the consumers. While daily commuters and the public are irked and are complaining, there seems to be no solution in sight. Vehicles and two-wheeler owners visiting the petrol pump are expressing their anguish over the daily rise in fuel prices. People from across the society are criticizing the Narendra Modi government that had promised of better days at the time of coming to power in New Delhi. The Congress workers with placards such as ‘Achche Din Ayenge’, ‘Is the petrol and diesel price hike to favour Modi’s favourite business houses,’ ‘Do not collect money for 2019 Lok Sabha Election by petrol price hike’, protested against the hike in petrol and diesel prices. Interacting with media persons in the side lines of the protest demonstration, Congress legislator and former minister, Ampareen Lyngdoh came down heavily on the Bharatiya Janata Party (BJP) for working against the interests of the people and demanded a roll back in the prices.